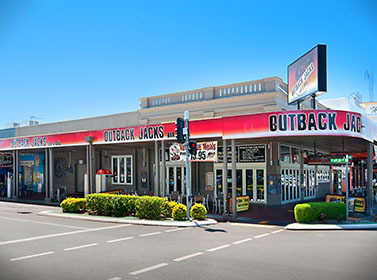 Outback Jacks Bar & Grill Cairns is the place for serious Steak Fans whom enjoy alfresco dining. The restaurant is fitted out beautifully with contemporary Australian themes and the Giant Crocodile over the bar is a stunning feature. 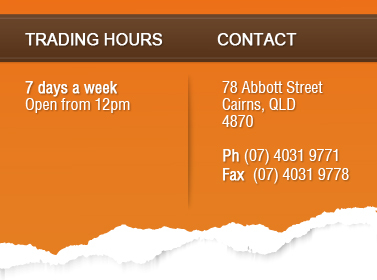 Outback Jacks Bar & Grill Cairns has a private elevated function “Top Paddock” area seating 80. Keeping with the contemporary Australian theme, the ‘Top Paddock’ suits small weddings, work meetings, conferences, ITO tour groups, etc. Function requirements from set menus, finger food menus, drink packages plus combined food and drink packages can be tailor made to suit your needs. The room is also available for company training days and meetings while community clubs can also utilise the room for meetings. The ‘Top Paddock’ is the perfect location for a great night out!